Doha: President of Indian Culture Centre Ms.Milan Arun addressed the issues of Blue Collored Workers in Qatar during interaction with EAM Sushma Swaraj during her visit to Qatar. 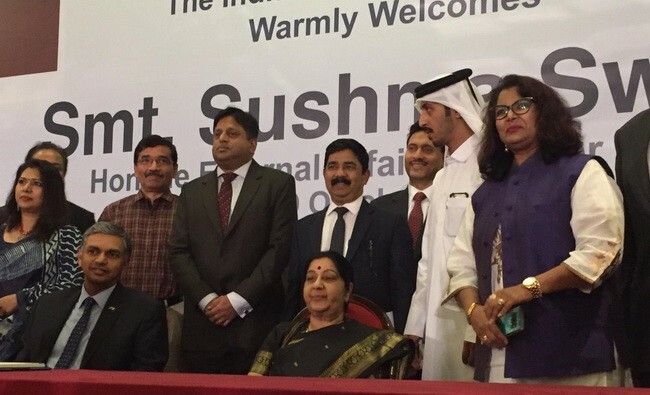 External Affairs Minister (EAM) Sushma Swaraj interacted with the Indian diaspora on Monday 30th Ocotober and put forth the initiatives which have been taken by the government for the Indian community's welfare in Qatar. "I always look forward to meeting members of the Indian diaspora on my foreign visits, and always request Ambassadors to schedule such events irrespective of its size," Swaraj said while welcoming the attendees. She further conveyed that immense progress has happened in India ever since the Qatari-Indian community left their native land. "India is one of the fastest growing economies, it is capable of shaping global; agenda. The Indian PM is counted amongst the eminent leaders of the nation. The welfare of the Indian community in foreign lands is an integral part of our foreign policy, and that is one of the biggest initiatives taken during this government's tenure," she said. Swaraj further said, "You must have felt this for yourselves, as we've sensitised our Ambassadors to cater to the welfare of our Indian community before taking foreign policy initiatives forward, as that is our bigger priority. That's why you always see our motto- Indian Embassy-a home away from home" on the standees at all our functions." She reaffirmed that the Indian Embassies all across the world are a "home away from home" for all non-resident Indians while putting forth that they can approach the embassy to allay any problems they may be facing in foreign locales. "We have proved time and again that we can rescue our Indian citizens, wherever they may be and that has led to the belief that relief is just 'a tweet away'. The characters of a tweet are enough for telling your grievances to us and we are there for you," the EAM conveyed. She also mentioned rescue efforts that have been undertaken by India. "Over 100,000 have been rescued by us so far, like Yemen, Iraq and Libya. I am proud of the fact that during the evacuations in Yemen, we not only rescued 5000 Indian citizens but 2000 foreign nationals as well. We rescued people from countries who everybody looked to for rescue operations, like the United States, United Kingdom, France, Germany and 45 countries like these and got their citizens back safely because we were the only ones being able to conduct operations at that time," she said. "Hence, The Indian Government's policy has changed to become more citizen-friendly. If there is an emergency in our neighbouring countries, we are the first responders in crisis always. Be it Nepal's earthquake or Sri Lanka's floods or even the Bangladesh's Rohingya crisis," she added. Swaraj also talked about India and Qatar's relationship at the do, "India and Qatar's relationship is a historical one, and we are one of the countries who have stood by Qatar, especially after the blockade, and Qatar's authorities recognise that. The authorities are keen on creating strategic partnerships with India and start initiatives in explored areas of partnership. They are looking to us to address their food security because of the blockade," she said. She also apprised the crowd about the demands that have been put forth by her during the meetings with the Emir and Qatar's Foreign minister today. "I also put forth a few demands from our end today. I asked them for a larger piece of land for our Indian Embassy, as we are a large community-we are more than 700,000 Indian people! We will not be able to function on an 1800 square metre land. We don't want anything below a 5000 square metre land for our embassy at a central location here. We want our embassy to be accessible to our community in Qatar, we need to see their convenience as well. They have told us that they will consider this demand positively," she remarked. "I also demanded a place of worship for the Hindu community here as none exist at the moment for a community as large as ours! Furthermore, I also demanded cremation grounds for our Sikh and Hindu community here, and the Emir has promised to take action on these two demands expeditiously," Swaraj said. She also conveyed how proud she was about the Indian community after meeting the Emir today. "The Emir started the meeting with me by conveying that the authorities love Indian people. They are hard-working, law-abiding people. You are our goodwill ambassadors here, you reflect Indian values. It was a very proud moment for me when I heard this and this was reiterated by the Foreign Minister as well," she stated at the event. Swaraj also interacted with non-resident Indians who shifted to Qatar who conveyed their experiences and grievances in the nation.